Contemporary probation practice is developing rapidly and is become increasingly professionalized. 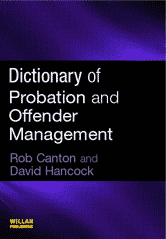 Probation officers are typically described now as offender managers, and the creation of NOMS (National Offender Management Service) has broadened the remit of the Probation Service. As well as bringing an increased emphasis on skills and qualifications it has also introduced a new set of ideas and concepts into the established probation lexicon - including institutional, legal, political and theoretical terms of its own as well as importing concepts from the disciplines of sociology, criminology and psychology.